In GatorLeads you have the option to create alerts. This is where you can set notifications to be sent to you and your colleagues, as well as pulling the contact information into a Gatormail Group when a Lead/Contact has met the criteria of your alert. 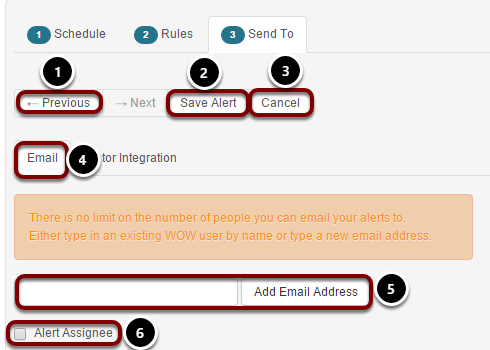 Below is one of our Whatfix flows, walking you through the steps of creating an alert. When logged into GatorLeads select the 'Alerts' tab. Once you have selected this you will be taken to the alerts page in which you can start creating your alert. 1. Click "Create New Alert". 2. As you are only able to have your contracted amount of live alerts, you can activate and de-active alerts. If you would like to change the status click on the alert state, this will then change the action. 3. The edit button will allow you to edit the alert that you have got set up. 4. if you would like to copy the alert click on the copy button and this will copy any information that you had set in the previous alert. 5. If the alert has finished then you can click delete. This will remove the alert from GatorLeads. 1. The orange box informs you of how many alerts you are allowed, and how many alerts you have enabled. 2. Enter the name of the Alert. 3. Click on the dropdown box and select the frequency of the alert. 4. Use the drop down to select the time you would like to run at. 5. If you would like the alert to be active click the 'Off' button and it will change it to 'On', and vice versa, for setting the alert to be disabled. 6. Click 'Next' to move on to the 'Rules' tab. On the rules page you have the option to pick what you would like your alert to be based on such as page visits or lead type, always making sure that the rules are turned ON when being set. Please Note: If you have more than one rule to an alert, they are AND rules. This means the lead will have to have clicked on a page URL AND as a lead band of hot. They have to fulfill all rule criteria shown. If you would like to set a rule based on a particular page the contact has visited, you can do this on the page visits option. 1. Make sure the switch has been set to 'On'. 2. If you would like to apply the criteria by URL, select the URL option. If you select the Page URL option please ensure that the page has tracking code situated on the page, if it does then paste the URL into the Page URL option. If it highlights green then this page is available, but if the URL highlights red then check that there is tracking on the page. If there is then please contact support@communigator.co.uk who will be able to help you with any problems. 3. if you would like to apply the alert criteria by Category select the category. If you select category you will have the option to select the categories that you would like to use for the alert. If you are unsure how to create a category please see the help article on this. You can set alerts to filter by campaigns. To use this function, you must be sending UTM values to GatorLeads. GatorMail does this automatically when post-click tracking is enabled in the Campaign Setup. UTM Campaign values from other mediums such as social or PPC can also be read, however this may mean there is no email address associated with the contact that matches the alert criteria. 1. You can either enter the campaign, alternatively you can use the search icon that is highlighted in the above screen shot which displays a list of all the campaigns that GatorLeads has picked up on. 2. You are able to select when you would have liked them to have interacted with the campaign. If you would like to do this click on the drop downbox and select the time that meets your criteria. The Referrer option allows you to restrict alerts to visits generated from specific third party sources. This is useful if you have campaigns driving traffic to a specific page on your website. The “Exact Match” option allows you to fully qualify a singular referrer source as opposed to any traffic from a third party in general. This will alert you when a certain keyword has driven a visitor to your site. You can only enter words, not phrases. Please Note: Due to Google’s recent changes, UTM keyword data is less commonly passed in links now. 1. You can search for the key words that have been used in GatorLeads alternatively you can enter the Keyword into the single line text box that is provided. 2. If you would like to have an exact match on the word select this option. This means GatorLeads will not provide an alert if it does not match the Keyword. To filter alerts by certain types of visitors, select the Lead Type and then set the types that you would like to include in the alert. Please note: You are not able to create new Lead types. These are all set as default in GatorLeads. To filter alerts by the status of the visitor, select Leads Status and then set the types that you would like to include in the alert. To filter your alert by Lead Band, select the relevant band. NOTE: you can only choose on band per alert. The bands are controlled as part of your Lead Score setup. this allows you to select the contacts that you would alert to be sent to. 5. Enter the recipients email address and click add email address. You are able to add as many recipients of the alert as you would like. 7. If you have your GatorLeads integration running you are able to pass the contacts that meet your alert criteria back to GatorMail. If you would like the information to be passed back to a CommuniGator group you need to click on the Gator Integration tab. 1) If you would like to Enable Gator Integration- please ensure this box is ticked. If you have GatorMail and the information is not being pulled across please contact support@communigator.co.uk who will be able to enable this featuer to your GatorLeads account. 2) Select the group that you would like to send the contacts back to CommuniGator in. If the group does not appear please see the help article on how to add groups so they appear in GatorLeads.